What you did at IU: Sports anchor and reporter for The Herald-Times newspaper, IU Sports Media reporter, sideline reporter for Big Ten Student U, Little 500 pit reporter, sports radio host for WIUX Radio, production runner for BTN, intern for CBS Sports Network for the 2018 Men’s Final Four, IDS Sports women’s tennis/volleyball reporter. 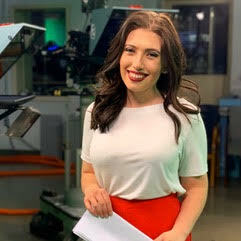 What you do now: I am a sports anchor and sports reporter at WCBI News (CBS affiliate) in Columbus, Miss. Advice for sports media students: My biggest piece of advice is to be a self-starter. It’s up to you to gain experience, find stories, build a reel, be comfortable on camera, and to find a job. Nobody is going to provide anything to you in this business. If you want to stand out, then you need to be able to make the calls, set up the shot, sit in the rain, do the interviews, and THEN be on camera. If you can be the person who can do it all, then you’ll be more attractive and valuable to anyone, regardless if it’s entry-level or requires 5-plus years of experience. With that being said, my other nuggets of advice would be to remain humble. Nothing is going to be beneath your standards, so try everything at least once. Don’t compare yourself to others, whether that’s you assuming you’re better than everyone else or needing to improve. Both mentalities are equally as toxic and will slow you down. Also, ask for help from trustworthy people. Reach out and build relationships with people you look up to. Once you’re in this industry, you will use those relationships every single day. This field is hard, and if it was easy, everyone would do it. It’s up to you to put in the work and succeed.